How GFL Environmental’s merger with Waste Industries is changing the waste management landscape in North America. GFL Environmental made waves Oct. 10 when the Toronto-based waste management company announced it would be merging with Raleigh, North Carolina-based Waste Industries. The completed merger, which was announced Nov. 15 with Waste Industries holding a total enterprise value of $2.825 billion, was celebrated by the participants as the creation of the largest private environmental services company in North America, encompassing operations in all Canadian provinces (except Prince Edward Island) and 20 states in the U.S. The combined company will operate 98 collection operations, 59 transfer stations, 29 material recovery facilities (MRFs), 10 organics facilities and 47 landfills with a total staff of more than 9,000. Together, the company will service four million residential solid waste customers and 135,000 commercial and industrial solid waste customers. While GFL has been a significant player in Canada’s waste management sector since 2007, the move marks the company’s first widespread entry into the U.S. market. According to Dovigi, although the announcement of the merger was sudden, the blockbuster deal has been a long time in the making. Dovigi says the common shareholder dynamic between the two companies and the relationships formed over this period were instrumental in laying the groundwork for the merger. “It was just an easy fit and easy transition, and I think the timing was right for both companies,” Dovigi says. Leading up to the merger, the companies worked to get to know each other’s businesses and consolidate IT, treasury, health and safety, legal and other back office processes to streamline operations. During this time, the company also worked to establish its executive team. Among the most prominent moves beyond Dovigi’s appointment, GFL announced that Waste Industries former chairman and CEO Ven Poole will now serve on the board of directors and retain certain senior employment responsibilities for the U.S. solid waste operations. Additionally, former GFL EVP & COO Luke Pelosi has been appointed EVP & CFO of the combined company to replace David Bacon, and Waste Industries EVP & COO Greg Yorston will take on the same role for all of the company’s solid waste operations in Canada and the United States. Dovigi says that although the merger includes some key personnel changes in the corporate office, it will be business as usual for most Waste Industries and GFL employees. Dovigi says that GFL and Waste Industries will continue to work through the merger over the course of the next calendar year to fully integrate the companies. “Over the next nine to 12 months, we’ll fully execute these plans and move forward as one cohesive group,” Dovigi says. Dovigi says that while there are differences between serving customers in the U.S. and Canada, specifically in terms of the importance of vertical integration in the States, he doesn’t anticipate a substantial learning curve acclimating to new solid waste markets. The major challenge, Dovigi says, will be understanding and navigating the current recycling climate. To meet the material quality specifications that are required today, Dovigi says the company is currently focused on retooling its MRFs with the latest technologies to better sort incoming materials. He also says that the company aims to promote proactive diversion throughout the waste stream by better educating citizens and corporate customers on recycling best practices. 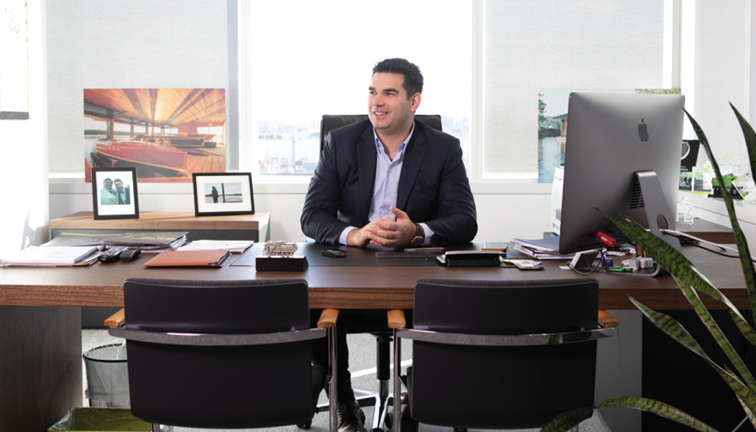 According to Dovigi, the merger comes at the right time for GFL in its strategic mission to build off its recent growth in the Canadian market. In addition to the Waste Industries merger, Dovigi pointed to GFL’s recent acquisition of Future Environmental as part of the company’s strategy to expand its North American presence into the U.S.
Based in Mokena, Illinois, Future Environmental is a provider of environmental services to the petroleum, pipeline, utility and chemical markets in the Midwest. Dovigi says that GFL will continue to pursue M&A opportunities to expand its footprint in North America in the coming years. The key, he notes, is finding partners like Waste Industries that check all the boxes of what the waste management company is looking for. “M&A has obviously been a large part of what we’ve done over the last 11 years, and I don’t think that’ll change,” Dovigi says. “Everybody has a little bit of a different lens when they look at M&A opportunities. For us, it’s No. 1 about if the acquisition fits in culturally with what GFL stands for. We look at culture and we look at certain geographies and regions that tick the box of where we want to be, but obviously reputation of the companies has to fit within what we’re doing. The decline comes with a dip in union membership across industries. The percentage of union members in construction has decreased by more than a percentage point, from 14 percent in 2017 to 12.8 percent in 2018, according to the U.S. Bureau of Labor Statistics (BLS). The decrease comes with a slight decline in the overall percentage of union membership in all industries, from 10.7 percent in 2017 to 10.5 in 2018. The total number of workers belonging to unions stands at 14.7 million. These numbers cover wage and salary workers belonging to unions broken down by demographics, industry, hours and state. BLS estimates the total number of employees in construction in 2018 was 8.169 million, up from 7.844 million in 2017. A total of 1.048 million workers in construction belong to a union. As the number of total employees in construction has risen and the total number of construction employees in unions has stayed consistent, one can conclude that many of the new workers entering the industry are declining to join their local union, Associated Builders and Contractors, Inc. says in an analysis of the data. • Hawaii joins New York as one of two states with the highest overall union membership rates in 2018, at 23.1 percent and 22.3 percent, respectively. • North and South Carolina had the lowest overall union membership rate in 2018 at 2.7 percent each. • The private sector union membership rate is 6.4 percent, which is lower than the public sector rate of 33.9 percent, as expected, ABC says. • Union membership rates were again highest among workers aged 45 to 64. Rates were 12.8 percent among workers 45 to 54 and 13.3 percent among those 55 to 64. • All states in the Middle Atlantic and Pacific divisions had rates above the national average. A total of 20 states came in at or above the national average, with 29 states and the District of Columbia coming in below the average. All states in the East South Central and West South Central divisions had rates below the national average. • California, New York, Illinois, Pennsylvania, Michigan, Ohio and Washington contained over half of the total union members in the U.S., while accounting for only one-third of total employment nationally. Within the next couple of weeks, the 2018 update of state-specific union membership data will be posted on unionstats.com. These numbers are compiled from the monthly household Current Population Survey using BLS methods. The site provides private construction percentages broken down by state, as well as numbers for certain metropolitan areas. The 2017 membership percentages for construction are also available on the Merit Shop Scorecard and will be updated as soon as 2018 state industry breakdowns are available. ABC says it will publish highlights of the breakdown. The full report is available on BLS’s website. Contact Brandon Ray, ABC National’s senior manager of state and local affairs, with questions regarding issues related to union membership nationally or in your region or state. The FAQs provide guidance to employers and employees on the standard's requirements. The U.S. Department of Labor's Occupational Safety and Health Administration (OSHA) has posted new frequently asked questions (FAQs) on the agency's standard for respirable crystalline silica in general industry. OSHA developed the FAQs in consultation with industry and union stakeholders to provide guidance to employers and employees on the standard's requirements, such as exposure assessments, regulated areas, methods of compliance and communicating silica hazards to employees. The questions and answers are organized by topic and include an introductory paragraph that provides background information about the regulatory requirements. Visit OSHA's silica standard for general industry webpage for more information and resources on complying with the standard. Bandit will now supply Pronar conveyor stackers and trommel screens. Bandit Industries, Remus, Michigan, has announced that it will begin offering select trommel screens and conveyor stackers manufactured by Poland-based company, Pronar Sp. z o.o. Bandit will unveil and demonstrate the Model 60 GT-HD stacker and the Model 7.24 GT at the U.S. Composting Council’s Conference and Tradeshow in Glendale, Arizona, from Jan. 28-31. The Model 60 GT-HD is capable of moving up to 600 tons of material per hour and stack material nearly 40 feet high, creating piles of material without the need of an additional loader or operator. The stacker can be mounted on tracks, making it easy to move around a grinding yard quickly. The Model 7.24 GT is a track-mounted or towable trommel screen that Bandit says has some of the highest throughput in the industry. This trommel is capable of screening a variety of materials, including compost, urban wood waste and biomass. Operators can swap out the drum screens to meet a specific size requirement. Bandit’s network of industrial equipment dealers will begin to offer these machines to its customers in 2019, and Bandit will begin to offer factory support as well. Pronar was founded in 1988 in northeastern Poland. Its owners founded the company focused on producing a wide range of machinery to across multiple industries. Bandit Industries was founded in 1983 in mid-Michigan and today employs nearly 500 professionals to produce hand-fed and whole tree chippers, stump grinders, The Beast horizontal grinders, track carriers and skid-steer loader attachments. Learn more about the Pronar trommel and stacker by visiting www.banditchippers.com or by calling 1-800-952-0178. Wolfgang Schiller will be responsible for further developing ZenRobotics’ business and accelerating the uptake of intelligent robots in waste management. ZenRobotics Ltd., headquartered in Helsinki, has announced that its board has appointed Wolfgang Schiller as the company’s new CEO, effective immediately. Prior to joining ZenRobotics, Schiller was the vice president, electronics industry, at KUKA AG, one of the leading suppliers of intelligent automation solutions. As CEO of ZenRobotics, Schiller will be responsible for further developing ZenRobotics’ business and accelerating the uptake of intelligent robots in waste management, the company says. Rising demand for intelligent waste sorting solutions paves the way for ZenRobotics’ expansion in deploying artificial intelligence- (AI-) based sorting robots to the waste management industry, the company says. His previous positions at KUKA AG include vice president, electronics industry; director, area Europe; and director, customer services Europe. Prior to KUKA, he held several management positions in various technology companies.